Start off your photo shoot at the Boatwright Memorial Library, the university’s most iconic building, whose Collegiate Gothic architecture is exemplary of most of the other campus structures. Have your wedding photographer arrange a portrait of the bride and groom beneath the beautiful arched entrance or a group photo on the verdant lawn in the foreground of the building. The library is just minutes away from Westhampton Lake, a perfect place to take wedding photos. Here, your wedding photographer can take some photos of the bridal party spread out along the bridge, overlooking the water. The bride and groom can then pose for an intimate portrait inside the charming gazebo that connects the bridge. Afterward, take a short walk to the Cannon Memorial Chapel, located in the heart of campus. The cozy benches in the chapel courtyard, combined with its colorful flower beds, create a gorgeous setting for both group and individual photos. Other great spots for photography on the campus include Dennis Hall, Ryland Hall, and the University Forum. 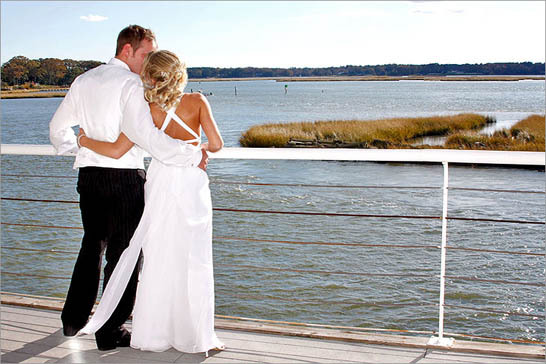 Richmond’s beautiful downtown area contains a number of stunning locations for your wedding photo shoot. Begin your wedding photography session at the magnificent Jefferson Hotel. Have your wedding photographer assemble a group photo of the bridal party in the front courtyard, beside the glimmering fountain. The bride and groom can then pose for a dramatic portrait against the hotel’s elegant exterior walls. Venture inside the hotel and you’ll find yourself in the luxurious lobby area. 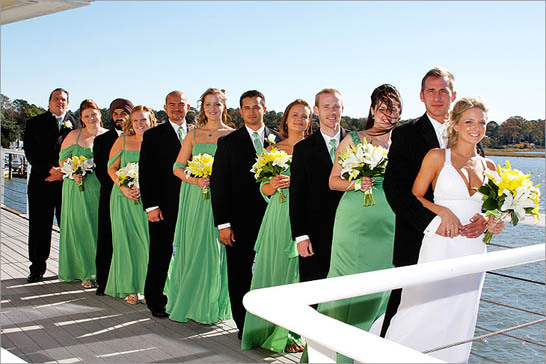 Here, your photographer can arrange a photo of the bridal party staggered along the stylish staircase or lounging on the chic lobby furniture. Afterward, the bride and groom can pose for an intimate portrait on the balcony overlooking the lobby. Once you’ve finished at the hotel, take a short limo ride over to St. Paul’s Episcopal Church, located directly across from the Virginia State Capitol. Upon arriving, your wedding photographer can organize some photos of the bridal party in between the towering Corinthian columns. Afterward, the bridal party can pose for some photos along the building’s front steps. Have your wedding photographer arrange a romantic portrait of the bride and groom in front of the entrance. From street level, your photographer can take a photo of the bride and groom with the church’s gorgeous Greek Revival architecture as a backdrop. Finally, take a short ride over to Richmond’s William Byrd Park, one of the city’s most popular public parks. Here, the bride and groom can walk along the paved walkway that surrounds the perimeter of the lake as your wedding photographer snaps some photos with the sparkling water in the background. The two of you can then pose beneath one of the park’s large shade trees for a private portrait. Have your wedding photographer end the wedding photo shoot with a group photo of the bridal party on the park’s lush green lawn. The most popular and scenic public park in all of Richmond, Maymont Park covers over 100 acres of expanse and will provide a stunning setting for your wedding photo shoot. Start off at the park’s gorgeous Italian Garden. Have your wedding photographer take some group and individual photos beneath the extended pergola at the western end of the garden. Afterward, take some time to visit each of the Italian Garden’s three levels – the Secret, Promenade, and Cascade gardens. Your wedding photographer can create some great wedding shots of the bride and groom, surrounded by vibrant, neatly-trimmed flower beds. Be sure to utilize the numerous gazebos that are scattered throughout the Italian Garden for some great photo ops. Next, visit the beautiful Japanese Garden, located in the eastern section of the park. Here, your wedding photographer can take some group photos of the bridal party beside the tranquil koi pond. The numerous bridges within the Japanese Garden will also make perfect spots for your wedding photos. For a truly romantic portrait, the bride and groom can pose in front of the garden’s glimmering waterfall. Maymont Park also contains an extensive statuary, whose diverse sculpture works will add a refined touch to your wedding photo album. In addition, you’ll find a number of ornate fountains as you explore the park that will make for some fantastic photo ops.